In 2006, I entered a period in my professional life that was nothing short of a nightmare. I was in a limited term instructor position at a small state university in Minnesotta that I was told would be become tenure-track after three years. In my second year I prepared to file my dissertation, which turned out to be such a stressful process of revisions and faxes and coming down to the last minute before flying to Los Angeles to file the final version with all the forms. With every hurdle sent me into a panic attack where my chest would burn but I had to maintain a facade of calm for my colleagues. Then, on top of everything else, the department decided to shift the position to tenure-track a year early. They did a full search and it became increasingly clear that while they loved me as a modernist, half the department wanted someone who specialized in contemporary art. Every day I went to work, I heard about new candidates for the position and how great they were. I lived in a constant state of panic. It was around this time that I discovered this poster online being sold by a bookstore in the UK. 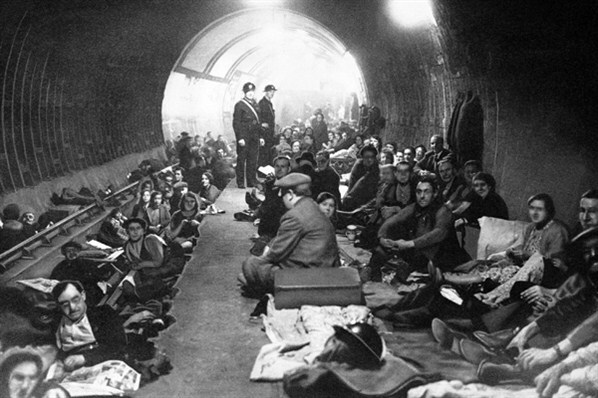 It struck me at the time because of it’s association with the London Blitz during World War II. Every day the people of London lived under the threat of flaming death and destruction from above. People huddled together in tube stations, often emerging to find their homes and neighborhoods destroyed and family and friends killed in the blasts. 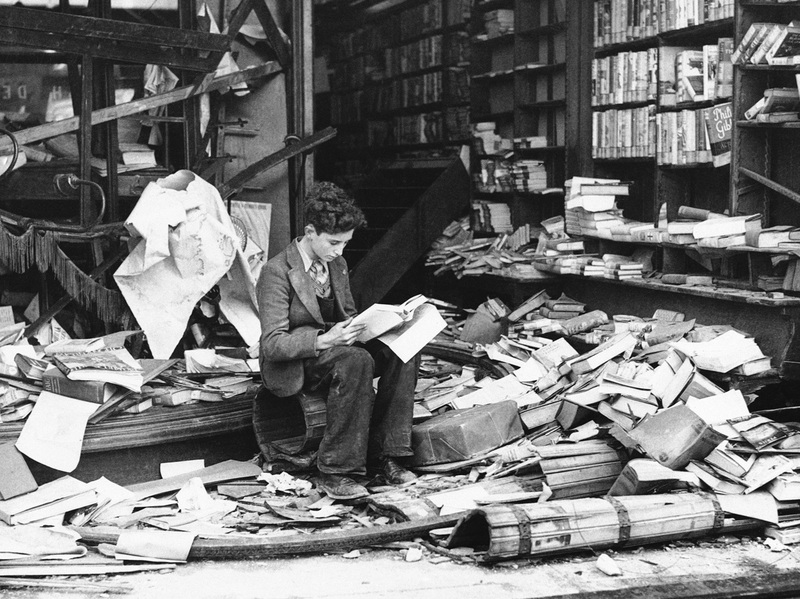 Boy in destroyed bookshop, London. The fear, the constant fear of losing everything, was something I felt I could relate to. While my problems paled in comparison, I was faced with losing my job, moving somewhere else with no money and no security. 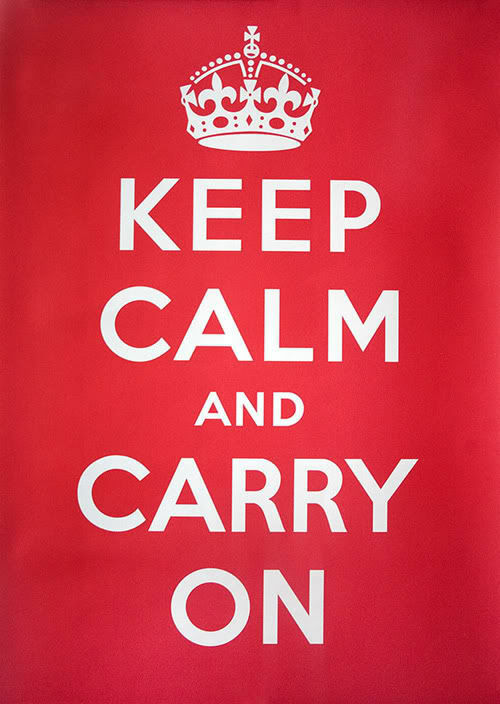 The motto “Keep Calm and Carry On” seemed so eminently brave and practical. I mean, what else can anyone do, really? I recited it every day. And it worked. They gave the job to a contemporary specialist and after breaking down for a week or so, I found a one-year position as a sabbatical replacement in Missouri. “Keep Calm and Carry On.” I was miserable in Missouri, living in a slightly-renovated, previously abandoned rented house located between a flop / meth / prostitution house on one side and an abandoned building on the other. While I was there, I taught my classes, presented a paper at a national conference and applied for over thirty jobs and finally found a tenure-track position where I am today. “Keep Calm and Carry On” kept me going. That slogan is taking over Houston. I saw it the other day when I bought a box of Tula Moon’s London notecards. Before that, I lose count. It seems to pop up everywhere in so many variations I almost dread looking at any blogs that pull from etsy!